I made this soup in response to cravings for a hearty vegetable soup. I know I’m not usually a veggie advocate, but I do like a good vegetable-based soup. 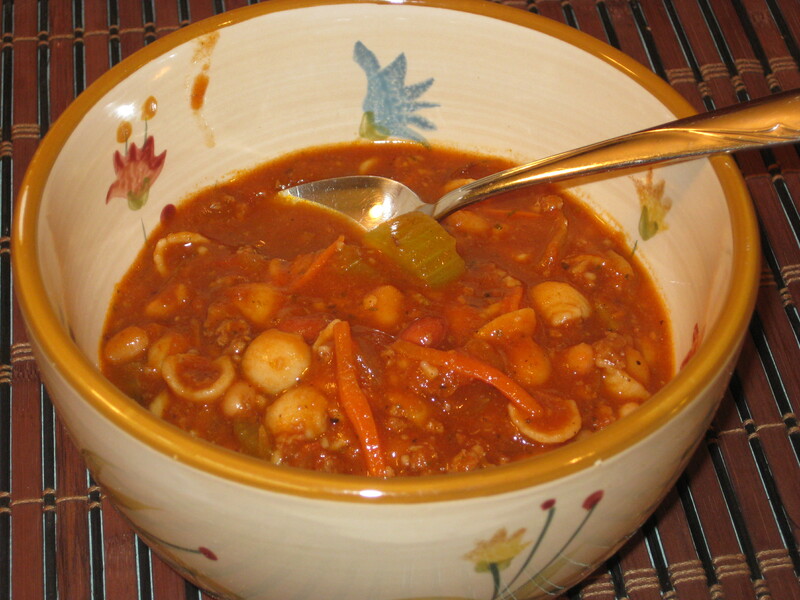 The flavor of this soup was just what I was looking for – hearty, tomato based, and well-balanced with the spices in it. I made this while I was trying to cut my meat consumption, so I cut the meat in half and doubled the beans. You could easily add more vegetables such as green beans for even more veggie goodness. Click for recipe. A sprinkling of parmesan cheese tops this off nicely. Serve it with some crusty bread from the bakery department at the grocery store, and it’s a nice, hearty meal on a chilly day!